Spicy roasted cauliflower is an easy cauliflower recipe for a side dish, snack, or appetizer. 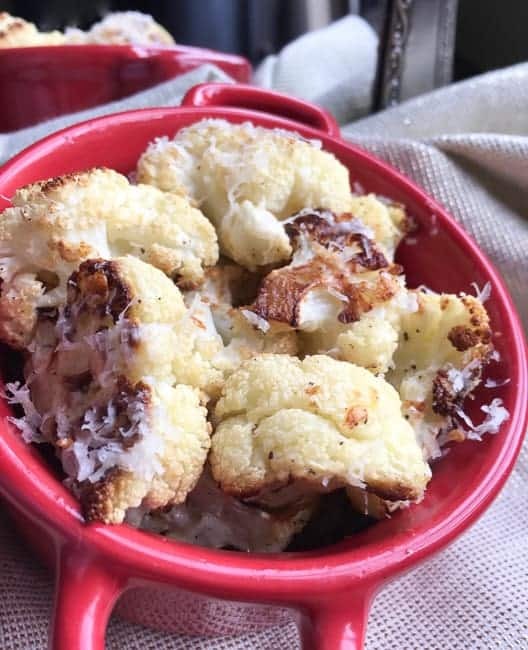 Cauliflower florets are tossed in olive oil, garlic, parmesan cheese, and red pepper flakes then roasted in the oven. Low carb, keto, and gluten-free! Welcome to My Kitchen Serenity! Let’s dig into this Spicy Roasted Cauliflower Recipe! Quick Note: This post contains affiliate links. Please read my disclosure statement for details. Thank you. Delicious, healthy cauliflower is kicked up a notch with this spicy seasoning blend. Adjust the amount of heat to your preference. This roasted cauliflower recipe is our favorite way to prepare cauliflower. Net carbs per serving: 3. Please follow me on Facebook, Pinterest, and Twitter! Step 1. Cut fresh cauliflower into bite-sized pieces. Place into a bowl or plastic sealable bag. Add olive oil and toss to coat. Place cauliflower on a rimmed baking sheet. Step 2. Mix chopped garlic, crushed red pepper, salt and pepper in a small bowl. Step 3. Sprinkle seasoning mixture over all the cauliflower florets and toss to coat. Step 4. Roast in a 450 oven for about 20 minutes. Remove pan from oven. Turn on broiler. 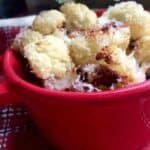 Sprinkle cauliflower with parmesan cheese and return to oven. Broil for about 2 minutes or until cauliflower is browned and cheese is nice and melty. Try this seasoning blend for other low carb roasted vegetable recipes. Broccoli, mushrooms, and zucchini are all great low carb choices. Cut fresh cauliflower into bite-sized pieces. Place into a bowl or plastic sealable bag. Add olive oil and toss to coat. Place cauliflower on a rimmed baking sheet. Mix chopped garlic, crushed red pepper, salt and pepper in a small bowl. Sprinkle seasoning mixture over all the cauliflower florets and toss to coat. Roast in a 450 oven for about 20 minutes. Remove pan from oven. Turn on broiler. 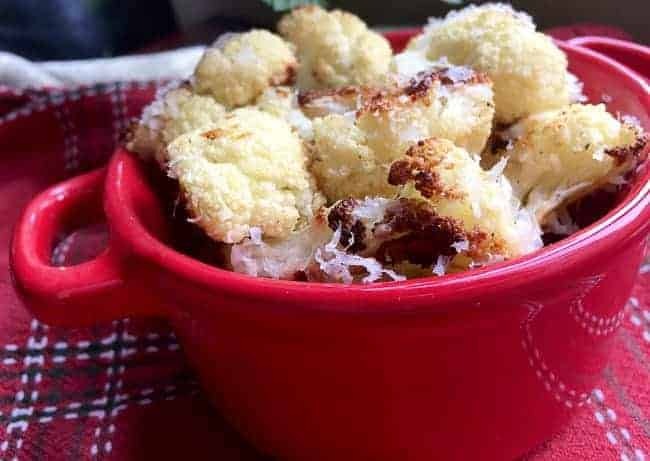 Sprinkle cauliflower with parmesan cheese and return to oven. Broil for about 2 minutes or until cauliflower is browned and cheese is nice and melty. If you try this recipe, let me know. I’d love to hear from you! Notes: Different brands will vary on the net carbs so keep that in mind. For the most part, they should be fairly close. Use a site like MyFitnessPal.com or FatSecret.com to figure out this information based on the brands or ingredients you used. Now the legal stuff (because my mama didn’t raise a fool): Please note that I am not a medical or nutritional professional. I am simply sharing my personal favorite recipes on this blog. Please consult with your physician before starting any diet or exercise program. I provide net carb information for my low carb recipes simply as a courtesy to my readers. I expressly disclaim any and all liability of any kind with respect to any act or omission wholly or in part in reliance on anything contained in this website.